Ant Financial Services Group, the company behind the popular payment app Alipay, is extending its tentacles to Bangladesh through a partnership with a local mobile financial service provider, another step toward its globalization goal of serving 2 billion users within 10 years. The financial technology giant on April 26 entered into an agreement with bKash, a payment platform established by the central bank of Bangladesh, pledging to help the latter with technological upgrades it needs to serve the country’s unbanked and underbanked population. The duo will join forces to co-create a local version of a mobile payment tool mimicking Alipay, with core functionalities like money transfer embedded on feature phones at the current stage, sources told China Daily. Financial terms of the deal weren’t disclosed. According to Bangladesh news portal bdnews24. com, the Chinese company will purchase a 20 percent of equity stake in bKash. “As part of Ant Financial’s global strategy, we are keen to share our technology know-how with partners like bKash,” said Eric Jing, chairman and chief executive officer of Ant. Established in 2010 by founding shareholders BRAC Bank Ltd and Money in Motion LLC, bKash has a network of more than 180,000 agents throughout urban and rural areas of Bangladesh with more than 30 million registered accounts. Cash remains the dominant transaction vehicle in Bangladesh, accounting for 94 percent of 4.4 billion transactions conducted annually, according to a 2016 report by The Better Than Cash Alliance under the auspices of the United Nations. The addition of bKash will bring the worldwide total of Ant-backed local mobile solutions to nine, most of which scattered across Southeast Asia from India’s Paytm to Telenor Microfinance Bank in Pakistan. “As China promotes the Belt and Road Initiative, there are certainly policy drivers at play,” said Li Chao, a fintech expert at Beijing-based consultancy iResearch. 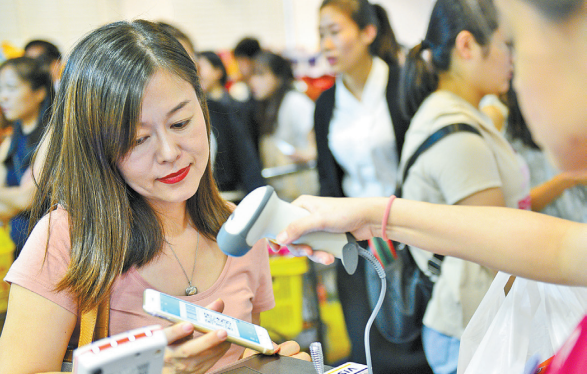 Alipay, which started out as a payment solution to facilitate e-commerce transactions of Alibaba Group Holding Ltd, is in a position to provide the financial infrastructure critical to Chinese small and medium-sized enterprises as they expand overseas, Li noted.